After an intense election season, BU PRSSA reflects back on the campaign to examine what communication strategies led to Barack Obama being re-elected as our country’s president, instead of his challenger Mitt Romney. On November 15, BU PRSSA co-hosted a panel discussion with SPJ, College Republicans, College Democrats and BU Marketing Club, that focused on answering questions related to the media’s impact on the 2012 Election Cycle. After a question and answer session, members of the audience were invited to tweet their questions for the panelists using the hashtag #campaignbu. The panel of speakers, hosted by BU COM professor John Carroll, included professors and working professionals knowledgeable in the areas of public relations, journalism, and advertising. 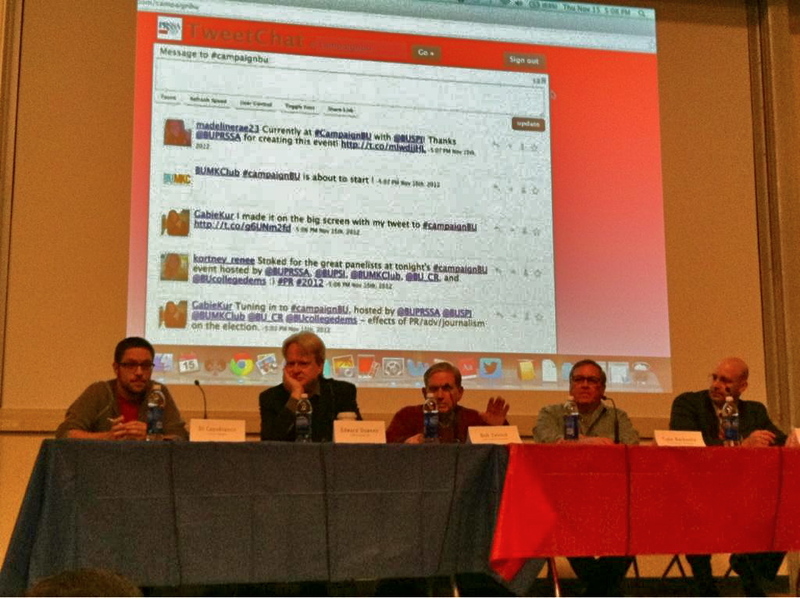 The five panelists were DJ Capobianco, Edward Downes, Bob Zelnick, Tobe Berkovitz and Seth Githell. The panel discussion began with the topic of digital media, particularly the effects of memes and Internet trends on the campaign. Capobianco commented that social media conversation is driven largely by memes. He recalled the day Romney made his “binders full of women” comment; jokes were almost all the conversation on Twitter for the first day. The second day, however, was half jokes, half discussion. In this way memes can open the door for policies to be discussed. Capobianco also noted that Romney missed an opportunity to come back with facts when the humorous discussion shifted to discussion about Romney’s policies. The next topic shifted to the role of traditional media. Zelnick commented that one of the most significant developments in political campaigns has been the decline of the influence of major media. He explained that it’s a different political world out there than it was 25 years ago. Githell spoke in defense of traditional media by pointing out that for someone to tweet something, someone has to generate substantial articles that you can provide links to. Non-traditional media can only take you so far; someone needs to generate the raw content. Estimates claim that over one billion dollars were spent on advertising during this presidential campaign. The advertising campaigns were almost always negative. Berkovitz explained that Romney tapped out his funds for advertising during the Republican Primary, and therefore couldn’t come back at Obama’s aggressive negative advertising during the campaign. Downes acknowledged that there should be some other form, but negative advertising is used because according to conventional wisdom, it works. The panelists also discussed crisis and Romney’s 47% comment. Githell believed this was a crisis that could not be fixed in words, but in image. The best thing to do would have been to show Romney being a regular guy with the people just listening, caring and coming up with ideas. Berkovitz made an important point, “If you’re in a hole, stop digging.” The Republican Party often found themselves making their situation worse during the campaign. The panel wrapped up the discussion by explaining that the Republican Party should have paid more attention to one thing in particular: demographics. Obama did a better job of understanding who his core voters were and how to reach them with his messages. Next Print Media: Dead or Dying?